Washington State has a wealth of recreation and cultural resources. There are over 20 million acres of land open to recreation in seven national forests, five national parks, and thousands of wildlife areas, working forests, conservancy lands, parks and other public places. Facilities include more than 14,000 miles of trails and 2,000 places where you can boat or fish. Wineries, museums, beaches, Sno-Parks, campgrounds and many other resources make Washington a top recreation destination. 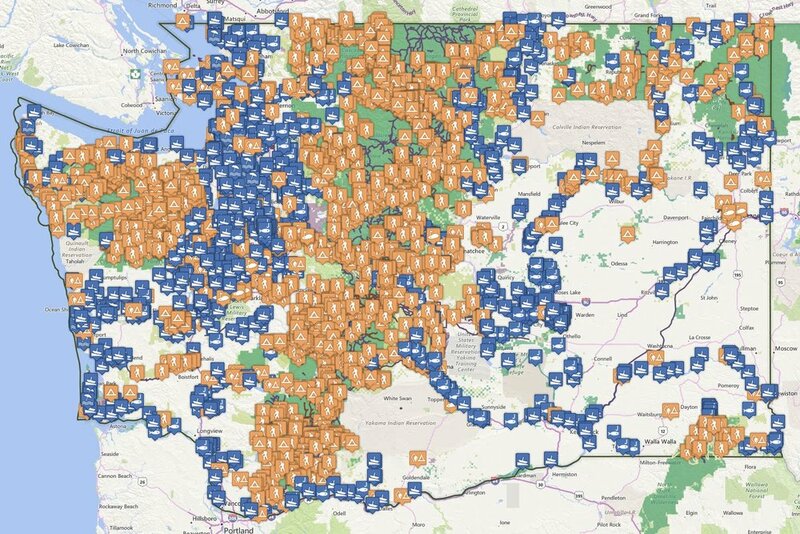 Washington Hometown is building a consolidated data set of recreation and cultural information that can be used for maps, apps and analysis. We have gathered information from more than 100 sources, verified it and added details about each place. We offer interactive maps tailored towards specific recreation interests that are supported by advertising, custom print and interactive maps, and data that can be used by organizations in their own projects. Washington Hometown has created a set of "Community Maps," focused on different interests from hiking and mountain biking to boating and camping. Businesses offering complementary services can pay a small fee to be included on the maps and any organization can use the maps by linking to or embedding them on a website. Tell your story and help people find the things that make your community or business special. The Washington Hometown data set is built from information provided by hundreds of organizations that use or manage recreational assets. You can contribute new places, fix errors, or add details about locations that are already in our database. Whether you want to promote tourism, create maps for publication, or evaluate recreation resources for a study, you can use our data with your mapping software or we can create custom maps for you. We offer not just recreation data but also information on science, culture and history points of interest. Jennifer Hackett founded Washington Hometown to address two challenges. As a new resident with two children, she struggled to find recreation opportunities in her area that would meet her needs (How difficult is the hike? Does it have a flush toilet? Does it require a Discover Pass?). Working in the field of geographic information systems (GIS), she was frustrated by the amount of time she spent searching for information for her recreation mapping projects. There was a wealth of available data but no single source, attributes were not standardized, and there were significant gaps. Jennifer decided to address these shortfalls starting in 2009 when she built a data set of recreation to support projects for the Kittitas County Chamber of Commerce and Ellensburg Downtown Association. This initial effort was expanded into the statewide Washington Hometown project in 2015. Her data set, drawn from over 130 sources with more than 14,000 records and growing, includes information from all of the major public recreation agencies, as well as county, city, utility and private assets. For each place, there is both a spatial record (point, line and/or polygon) that allows it to be mapped and a database record with 100+ fields that captures information about each place. Information from the Washington Hometown project is available to the public through a set of interactive maps oriented towards users, as well as the Kittitas County visitor site, the Recreation and Conservation Office Land Interactive Mapping Tool and the Mountains to Sound Greenway web map. The data is also used on maps created by Washington Hometown and is available by subscription to any group with their own mapping program.